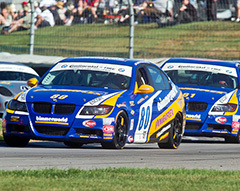 The BimmerWorld Racing team left the Indianapolis Motor Speedway last year with an incredible 1-2 finish on GRAND-AM’s debut at the famed circuit, claiming the Street Tuner class victory with the BMW 328i platform it has developed since 2006. On the series’ return to race on the Indy road course built within the iconic 2.5-mile oval facility, the Virginia-based BMW tuning and aftermarket specialists are gunning for a repeat of the stellar result that was earned in 2012. But as BimmerWorld owner/driver James Clay shares, while the team is confident going into the event, there are no guarantees of success in a competitive championship like the Continental Tire Series. ”Certainly you can’t expect the same results every year at the same tracks, but I do feel that there are trends of some tracks suiting some car models,” he said. ”Similarly, there are trends of models being stronger and less so as the series balances performance. I think the last round of adjustments continued to help the cars already making more power than development gains on the other areas that make a car fast. BimmerWorld’s 1-2 finish was the highlight of its season, and also put a spotlight on its supremely talented pit crew members and race strategists. Beyond the excellent performance by its drivers at Indy, BimmerWorld’s staff on pit lane also contributed heavily to the win. For Dan Rogers and Seth Thomas, the drivers who piloted the No. 82 CRC BRAKLEEN® BMW 328i to victory at Indy, the upcoming race feels like a homecoming after creating such indelible memories in 2012. ”The Indy win was undoubtedly huge,” said Rogers. ”It is always the race people bring up when they start talking about racing with me, so, in that sense, it is something significant to be remembered. When I occasionally reminisce regarding the race, the memories and thoughts that come to mind are of HOW we won the race, not THAT we won the race. Indy 2012 was truly a team win. BimmerWorld’s Gregory Liefooghe is always a threat to win with teammate Tyler Cooke in the No. 81 BMW 328i, but was unable to finish the inaugural Continental Tire Series race at Indy. The respected touring car ace has been waiting for a second chance to race at the Brickyard, and sees a lot of strengths throughout the program to utilize in his bid for a win. The team will have a new addition to the No. 80 BimmerWorld BMW 328i program as Greg Strelzoff welcomes Kevin Gleason to the cockpit for the event. Gleason, who is driving in place of Connor Bloum who injured his leg in an off-track accident, says he&rsdo;s looking forward to driving for one of the elite teams in the GRAND-AM paddock. Follow BimmerWorld’s progress at Indy atwww.BimmerWorldRacing.com, and be sure to tune-in for the race broadcast at 4 p.m. ET on August 3rd on SPEED.